Just curious how many pilots weighing over 90 kg (200 lbs) are flying the Top 80 and liking it? I ask because I continue to run into older pilots tipping the scale around this weight who want to foot launch but can't handle the weight of heavier motors. Of course a lot depends on the glider they are going to fly. My flying buddy is just over 90kg. He has been happily flying a Miniplane Top80 with a 130cm prop for the past 3 years. His wingis an Ozone Roadster 30, although he has flown with my wing, a Roadster 28. He is planning on upgrading to an Ozone Speedster 26. We regularly flying take-off in nil wind. There is a video on Youtube showing a tandem flight with a Top80. I'm 60 years old, 210 lbs (15 lbs overweight), bad back and assorted other minor physical problems, the result of too much fun! 13 years PG and 10 years PPG, I have tried a lot of other motors, but I've found the Mini Plane Top 80 to be the best over all paramotor. A great combination of weight, balance, dependability, power and it's easy to start. I throw my Mini Plane on my back and walk around without a problem. I usually fly at lower altitudes and prefer a 3-7 mph wind for launching so that I don't have to run, it has plenty of power to get me into the air with minimal effort (Ozone 24m Viper 2). The light weight makes the unit easy to maneuver on the ground and the lack of torque isn't missed. Granted it doesn't have the power of a bigger, heavier motor, so you won't be wanging it around as much, a matter of trade offs. The Mini is fragile and I recommend being very proficient with the wing before putting it on. It's so simple to work on if you do screw up, easy to fix and parts are easy to get. As for a disclaimer I am a longtime friend of Chad's and work as one of his instructors, but I'm not a dealer and wouldn't fly the Mini if I didn't love it. When the Top 80 motor first came out, Jeff Thompson (160 lbs.) and I (150 lbs.) did a of couple tandem flights with his Sky Cruiser Top 80 with a 46" prop. We had to run a good distance on launch and we climbed out slowly, but we flew. I have also witnessed Rick "Ricarus" Agger at 230 lbs. fly a Top 80 powered Sky Cruiser. He had to wait until winds were 8-9mph., and I don't recall him forward launching it in low winds. The bigger props used with today's motors have helped with static thrust so a wider range of pilots can fly them. The Top 80 is a great little motor. It does pretty much everything right...it has low vibration, fuel efficiency, light weight, quiet operation and parts are accessible. It also has one thing the newer motors don't have, it's been flying successfully for about 17 years. I’ve been flying my MiniPlane/Top80 ABM for about 4 years now and I love it. I have flown it as heavy as 200 lbs. I’m 55 years old with various physical limitations, bad back, trick knee, old shoulder injury, etc. Over the past 10 years Diego has been refining the Miniplane Top 80 (weight shift frame, exhaust, carburation, gas tank, re-drive, props and more). To the point where the Miniplane / Top 80 has great thrust and is a very reliable lightweight motor. There are many features that are not fully appreciated until you have owned some other motors to compare to (I’ve owned 4 others). So I’ll try to describe the features that make the Miniplane/Top 80 superior. First the frame is very light. If you study it’s construction you will see that the aluminum tig-welds are done by master craftsmen. The frames will not crack like some others. Each tube is carefully chosen for it’s shape wall thickness and diameter. Triangulation is used throughout so that fewer and smaller diameter tubes can be used. The frames are finished with quality powder coating that is very durable. The ABM (weight shift frame) is so well designed it allows great weight shift without any for / aft tilting because the center of thrust is set up correcty. It flies straight at full power with no big torque induced turn and is very comfortable to fly. Power: Other manufactures tout their “better”, “lightweight”, “strong”, frames with 90, 125, or even 180 cc backpack motors. But bigger single cylinder 2 -strokes have more vibration. They are literally trying to shake themselves apart. So when it comes to single cylinder 2 strokes the smaller / more efficient you can get away with, and still have the thrust to fly, the less vibration you will have and the lighter frame you need. Some very powerful engines exhibit huge torque steer which can be dangerous. Smaller engines use less gas. This is a huge factor. For example I also have 202 cc motor (on a trike). It uses 4.6-5.3 liters/hr. during general flying, (cruise, climb, descending, and playing). Conversely my Top 80 uses just 1.8-2.1 liters/hr. If you like doing long cross country flights this makes a gigantic difference. Gas weighs 6 lbs./gal. so for a 3 hr. flight with the 202 the fuel load would be 21 lbs. vs. 8.5 lbs. for the Top 80. My Miniplane/Top 80 weighs 43 lbs. + 8.5 lbs. fuel = 51.5 lbs. total (for a 3 hr. flight). Add a reserve and flotation device and it’s around 57.5 lbs. that your launching with. A Blackhawk / 125, for example, weighs 52.5 lbs. + 18 lbs. fuel (3.7 liters/hr.) = 70.5 lbs. (for a 3 hr. flight). With reserve and flotation it’s 76.5 lbs. That’s 19 lbs. difference. You will have 76.5 lbs. on your back that you must run with to launch (for a 3 hour flight). Imagine doing a no wind forward with 76.5 lbs. A Talon 175 would be even worse at around 82 lbs. (ready for 3 hrs. with reserve/flotation). This is one reason I chose to sell my other motor and now fly the Miniplane/Top80. Most times when I fly my load is around 52 lbs. My back is much happier and flying is easy and fun again. Efficiency is the secret tosuch a lightweight system and contributes greatly to the reliability. Lightweight is the secret to easy launches and landings. Quietness is part of the secret of comfort while flying; and to your neighbors comfort on the ground (which helps keep flying sites open). Some other factors that contribute to efficiency that are not so obvious at first glance are. Prop hoop and netting. The netting is there to hold the hoop tight against the frame, (like spokes on a wheel, it adds strength), and to keep brake toggles and loose clothing from getting sucked into the prop during flight. But it should never be relied on to keep body parts from contacting the prop. 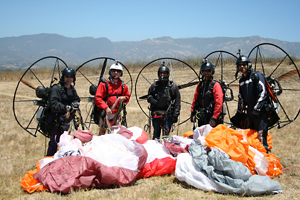 Body parts in the prop is the biggest danger in paramotoring and a super strong netting and cage can give a false sense of security. The best way to sty safe is to only start, (and run up), the motor on your back, or if the motor/prop is secured in some way. This brings up another important feature, ease of starting. Bigger motors are harder to pull start. This is because of more displacement, higher compression, and some have no clutch. Having a clutch is key to safety, it means you can immobilize the prop while you start up the motor. Bigger motors with no clutch allow the prop to spin when they start. If you have a stuck throttle, and it does happen, they can go to full thrust in an instant and you can be hurt very badly. Bigger motors are also much harder, or even impossible to start while on your back, due to the mechanical disadvantage your arm is in when above your shoulder trying to pull start. This is why some pilots will start them on the ground first, then put them on their backs to fly, and why instructors will start them up for you while on your back during training. Most 125’s, & 130’s do have a clutch and you can immobilize the prop to start it on the ground first, and then put it on your back, but they can still be hard to start over your shoulder or for in-air re-starts. The Miniplane netting is very thin and strong. Bigger netting is “dirtier”, large hoops are “dirtier”, double ring hoops are especially “dirty” and hoops too close to the prop all contribute to more turbulent air reaching the prop. The thin netting, with a thin clean hoop, and thin radial arms allow “clean air” to reach the prop, and this contributes to the prop’s efficiency, which equates to thrust, which allows for a smaller engine that is lighter, uses less fuel, etc. Another way Miniplane / Top 80 mproves airflow to the prop is by moving the gas tank up out of the airstream. The custom moulded tank is designed to mount up behind the pilot, and to fit the frame in such a way that it becomes the curved smooth back support for the harness which allows easy transitions from running to seated flying position. Under the seat is only one thin horizontal tube and the prop receives airflow the full 360 degrees. Some motors have the gas tanks hanging down below the harness blocking air from reaching the prop, and they have larger exhausts and air boxes which protrude out the sides, meaning even less airflow. More drag, blocked airflow, and dirtier airflow requires more prop and more HP to produce same thrust. It becomes heavier, runs hotter, has more vibration, is less reliable, is louder and is less comfortable to fly. The Miniplane system minimizes drag and maximizes airflow, resulting in more efficient thrust. Realizing early on that heat was the enemy of reliability Diego developed a fan and cooling shroud system that keeps everything running cool. With the motor sitting behind our backs in the pusher configuration, it struggles to get enough cooling air. Larger direct drive engines sometimes rely on the prop to pull air past the cylinder for cooling. This is a loosing battle and others have now developed fan & shroud set-ups. A small well designed motor is easy to start requiring only a very lightweight pull starter. The Miniplane starter can be delicate and must not be treated roughly. Some bigger motors use electric start, which adds a ton of weight and complexity. Some use a “flash starter” which stores energy in a secondary spring and releases it suddenly to start the motor. This is a clever solution but again it adds complexity to the system just to overcome the problem of bigger motors being inherently harder to start. I find the light and simple Miniplane starter system to be the easiest and best I have ever used. A few other great features. A simple priming and fuel delivery system that uses: a no fuss, fixed jet carburator with a unique primer. A small lightweight custom moulded throttle that’s totally sealed, to keep sand from jamming the cable housing, and mounts securely at the carb. An easy to access, in flight, choke control. A 10 micron in-line fuel filter that prevents carb blockage. A tank check valve to keep gas up at the carb and allows easy in-air re-starting, a fuel pickup filter that separates out water from the fuel, and an 11 liter gas tank that allows for 5 hr. + flight times. The exhausts are made of aluminum, titanium, and mild steel. They are very quiet, very light, very compact, do not crack, or leak, and produce the most power ever. Miniplane makes 4 different gear re-drive ratios for whatever configuration you need. The 2 piece carbon fiber props from Miniplane are powerful, quiet, lightweight, and durable. Try one it may surprise you. I can even fly tandem no problem, @ sea level anyway. Mike, you forgot something important……this group. Over the years I have had help from pilots all over the world. I don’t think that I have ever waited more than a couple of hours for a response…………and that is priceless. AAAh to be so young. I am 77 years old and I love my Miniplane. I normally fly with an Apco Lift 26 (I am 83 kg = 183 lbs in the old Imperial units) but have used a mini wing a few times (ITV 18sqm).